The decision by President Muhamadu Buhari to replace embattled chief justice of Nigeria, Walter Onnoghen, with Mr. Ibrahim Tanko Mohammed, have been met with negative reactions from Nigerians. 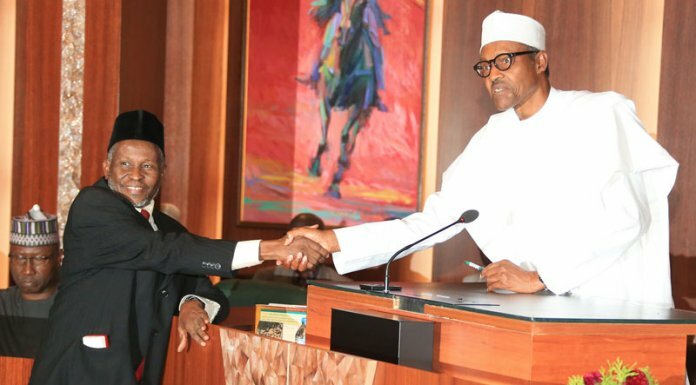 The embattled CJN was suspended by the code of conduct tribunal following allegations of corrupt practices. What President in the world can illegally suspend the Chief Justice and swear in a Sharia adventist as Chief Justice? The person Buhari unconstitutionally used to replace Onnoghen (Ibrahim Tanko Mohammed) is a Sharia Judge with a Ph.D in sharia law. The post #BuhariOut#: The Person Buhari Unconstitutionally Used To Replace Onnoghen Is A Sharia Judge – Nigerians Reacts appeared first on Naijaloaded | Nigeria's Most Visited Music & Entertainment Website.